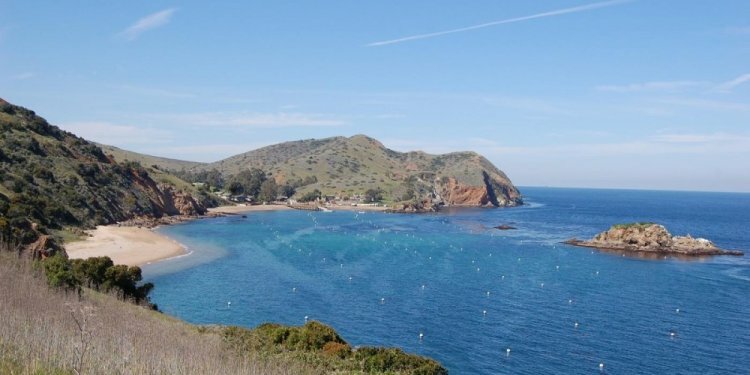 Considered a cruiser’s paradise, Two Harbors is situated at the Isthmus of Catalina Island. The crystal clear waters and unspoiled vistas will enchant you, and the friendly locals will do their best to help you make the most of your stay. The village of Two Harbors and the secluded coves nearby each have mooring and anchorage options to make discovering all that Catalina has to offer an easy experience. When you arrive, contact the Harbor Department via VHF Channel 09 to find your assignment and pay your fees. If you cannot reach the Harbor Department, take the closest mooring and pay your fees the next morning. Please note: Use caution when approaching Isthmus Cove, as the reef, denoted by a sign and lights, is located on the landside of Bird Rock. Catalina Harbor is Santa Catalina Island’s most protected harbor, as well as one of two U.S. Coast Guard-designated “Year-round Safe Harbor” in Southern California. It has 96 moorings and anchorage for more than 200. Ballast Point, a natural sand spit, extends across a portion of the Harbor entrance. There is a public dinghy dock, on-shore picnic facilities, and we offer free pump-out services for Cat Harbor boaters. Contact the Harbor Patrol on VHF Channel 09. From the dock, it’s a half-mile walk on flat terrain to the village of Two Harbors. A shuttle is available on summer weekends. Isthmus Cove has 242 moorings and more than 100 anchorages. Isthmus Cove is second only to Avalon Harbor in boat activity on the Island. Ferries from the mainland dock at the pier in Isthmus Cove. The Two Harbors Harbor Department is based here. Shoreboat rides are available year-round with 24 hour-a-day service in the summer and a more limited schedule in the winter. Located west of Isthmus Cove, 4th of July Cove has 42 moorings and deep water anchorages (100 feet). The Banning Family held many 4th of July celebrations here. The Fourth of July Yacht Club leases the on-shore facilities. Cherry Cove has 99 moorings and deep water anchorages (100 feet). On shore there is a Boy Scout camp and up the nearby canyon are large groves of Catalina cherry trees and Ironwoods. A point of land, called Lion’s Head, protects this cove from the prevailing afternoon winds. Howland’s Landing has 40 moorings. Catalina Island Camp is located on shore and the Los Angeles Yacht Club has shore-side facilities. The Howland’s Landing watershed is the largest one on Santa Catalina Island’s West End. West of Howland’s Landing is beautiful Emerald Bay. It has 100 moorings and anchorage for five to ten boats. This cove offers a long strip of natural sandy beach that boaters an access. The Corsair Yacht Club and a Boy Scout Camp have facilities here which are private and not open to the public. Little Geiger Cove is an intimate cove with only one mooring. Little Geiger Cove’s on shore area is leased to the Offshore Cruising Club. West of Little Geiger Cove is Big Geiger Cove, with 10 anchorages and facilities for the Blue Water Cruising Club.